This is a battle of the restaurant burgers. They also happen to be non-American cuisine restaurants, which makes it even more interesting that they both have burgers on their menu. A French burger vs. an Asian burger. Something you probably couldn’t have said 15-20 years ago. But nowadays it seems that every restaurant needs to have a burger on their menu, even if it doesn’t necessarily make a whole lot of sense. Luckily for us, both of these restaurants have great burgers with tons of unique flavors, which makes up for any menu confusion. ChoLon, which translates to “big market”, is named after the largest Chinese-influenced market in Saigon, Vietnam. ChoLon has a full lunch and dinner menu, but also offers a small bites menu with delicious options like shrimp toast, pork belly buns, and French onion soup dumplings. The menu features interpretations of traditional Asian dishes that have just enough of a modern twist to them. 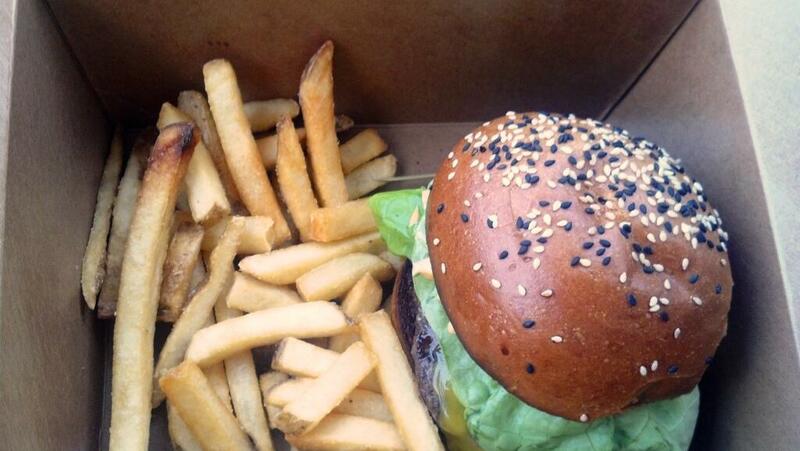 Their burger flies a bit under the radar, as it’s only served at lunch which limits its exposure. Although the burger starts out a bit unassuming, it only takes one bite to realize that the burger at ChoLon is a definite title contender. The burger starts with an Angus beef patty, cooked to order. It’s topped with Korean onions, a spicy Asian mayo, a 63-degree egg, lettuce, all nestled between a ridiculously delicious brioche bun that has white and black sesame seeds on top. (A 63-degree egg is slow cooked in the shell in a water bath of 63 degrees celsius. 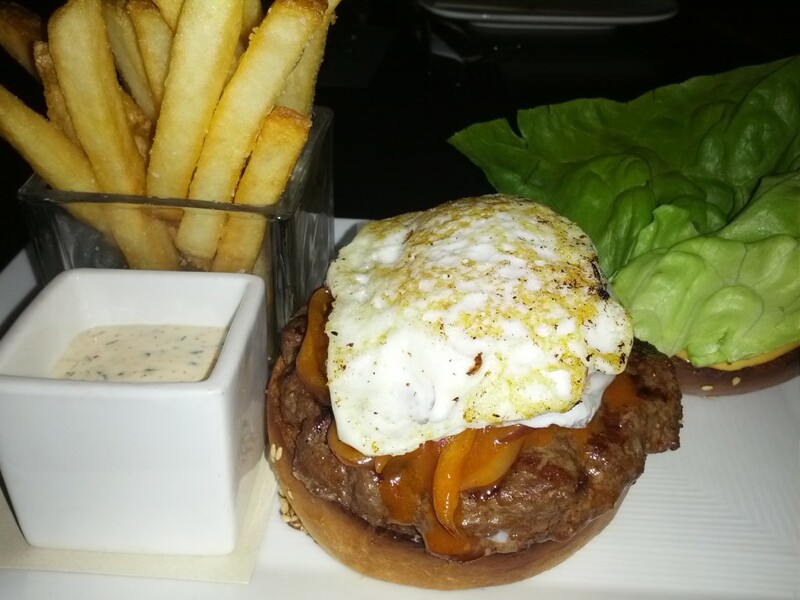 The shell is removed after the cooking process, and the result is something close to a poached egg except that the yolk is thick but still golden) The result is a burger with tremendous flavor, with each topping working together in harmony to create an awesome burger experience. The Korean onions are soft, grilled, tangy, and a little spicy. The mayo has a ton of great Asian flavor, and the egg gives it on over-the-top unctuousness. The burger meat is cooked perfectly, and the patty is just big enough to know that you’re eating a good burger, but not too much meat that it becomes chewy or doesn’t allow the other toppings to export their flavor to your taste buds. I don’t know if it was the spicy mayo, or the juice from the Korean onions, but the entire experience made me feel that I was eating something that was both unique and familiar. I finished the burger but my mouth tasted like I had just eaten a great bowl or ramen or other great Asian dish. Side Note: The burger is served with a side of fries for $12. The fries are one of the best we’ve had during the Denver Burger Bracket, and the dipping sauce that’s served with the fries is another great find. It’s a dill, garlicky aioli which is fantastic. Le Grand Bistro & Oyster Bar is Denver’s premier French restaurants, serving up all of the classics. From moules frites to stinky cheese, and even (you guessed it) a great raw oyster selection, Le Grand Bistro has everything you’d be able to eat at a Parisian bistro. The Le Grand Burger starts with a Colorado’s Best Beef Company burger patty and is topped with heirloom tomato, Bibb lettuce, aioli, caramelized onion, and Gruyère. 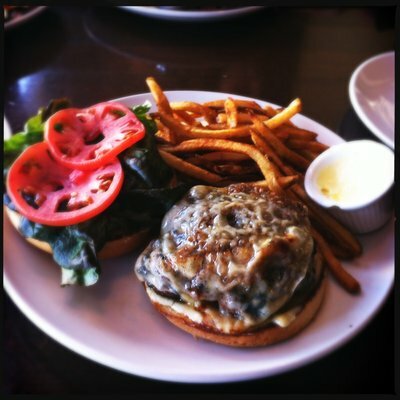 Served on a potato bun and with a side of delicious pommes frites (possibly the best in the city) for $14. With the classic and elegant ingredients listed in this burger, it should have most likely cruised to an easy first round victory. But a couple of errors in preparation completely derailed this burger train. The first thing that came to my attention was how the burger was cooked. I asked for it medium, and it came just that way (maybe a little bit more pink than medium, but that’s not a bad thing). But when I took my first bite, juices were literally running down my face, and created a puddle where the picked-up burger once was. This happens because they didn’t let the burger sit for a minute or two prior to putting it on the bun. A juicy burger is one thing, but a completely wet and disintegrated bottom bun and a puddle on the plate is another thing. The other factor that I only noticed as I kept eating was the amount of salt I was tasting. It built and built (maybe because of the awesome pommes frites I was devouring at the same time, or maybe it was the choice of Gruyere, or maybe just an over-seasoned patty) to the point where the saltiness became overwhelming. I don’t usually mind salty food, and salt definitely works well with the fattiness of a burger patty, but it became too much. Even though both restaurants aren’t where you’d think you’d be able to find a good burger, both do a great service to the burger gods. But in this match up, ChoLon came out of nowhere to take the win, and looks like a true title contender.